Home > What is Soap? All soaps are not the same. In fact, many products available in stores today aren't even soap at all — they are actually detergents. Products called "beauty bar" or "deodorant bar" are really detergents designed to look like bars of soap, though they are made with the very same harsh chemicals you might use to wash your car or your dishes. So, what's the difference? To begin, natural soap is made only from simple substances like organic vegetable oils, water and lye (sodium hydroxide). Soap cannot be made without lye. The chemical reaction of these ingredients is called saponification and it is during this process that glycerin is naturally produced. Because of precise formulation and a curing period of at least one month, there is absolutely no trace of lye left in what is now a lusciously lathering, gently cleansing soap. Detergents are popular with big "soap" companies because they're made from synthetic ingredients derived from petroleum and are incredibly cheap to produce. So, the companies profit and our skin pays for it. WoodSprite Organic Soaps are handmade from scratch in small, artisan batches using only high-quality, natural ingredients carefully chosen for their healing or beneficial properties. Organic Olive oil, the base oil for all our soaps, contributes superior mildness and moisturizing properties to soap. Organic coconut oil produces profuse, fluffy lather—even in salt water! Organic palm oil imparts hardness and stability. Almond, castor, avocado & apricot kernel oils and exotic butters of shea, cocoa & mango add emollience and nourishment to soften the skin. 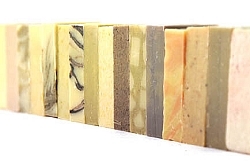 Finally, only pure aromatherapy grade essential oils and organic herbs and botanicals are selected to complete the experience of handmade, beautiful, all-natural soap. You will find no artificial colors, fragrances, fillers or preservatives in WoodSprite Organic Soaps. Perhaps the most important difference, though, is how our soaps feel. We are confident that once you have experienced the richness of our natural soaps, you will never want to use anything else on your skin!